Jatiya Adivasi Parishad on Wednesday demanded the government retain the existing quota system for indigenous community, ethnic minority, tea workers and backward people in government jobs. 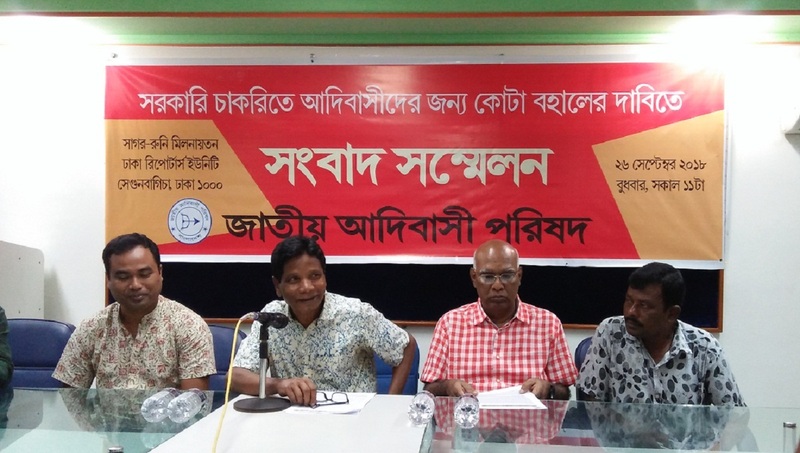 “The indigenous students will lose their interest in education and extinct gradually if the state’s ‘stepmotherly’ behaviour with us continues,” said Rabindranath Saren, President of Jatiya Adivasi Parishad, while addressing a press conference at Dhaka Reporters Unity (DRU). He said Articles 28 (4) and 29 (3) of the constitution directs to take special steps for indigenous and backward people. Though the 2008 and 2014 election manifestoes of Awami League also mentioned the overall development of indigenous people, it did not happen in reality, Saren said. There is no scope to abolish the quota for indigenous people as it is a legal demand, said Fazle Hossain Badsha, General Secretary of Bangladesh Workers Party. Prof Mesbah Kamal of Dhaka University’s History department and President of Oikya Nap Pankaj Bhattacharya also spoke at the press conference. In the face of a countrywide demonstration by general students and jobseekers demanding reform in the existing quota system in public service, the Prime Minister on April 11 had announced that the system will fully be scrapped. On September 17, a seven-member government committee, led by Cabinet Secretary Md Shafiul Alam, recommended abolishing the quota system for Class I and Class II government jobs.